Oak-Leaf Hydrangea, Hydrangea quercifolia, is a large shrub with showy white flowers that bloom in the early part of the summer. Looking at the photo brings back the brightness and heat of the day on which I took the photo. This entry was posted on Sunday, May 20th, 2012 at 5:47 pm. 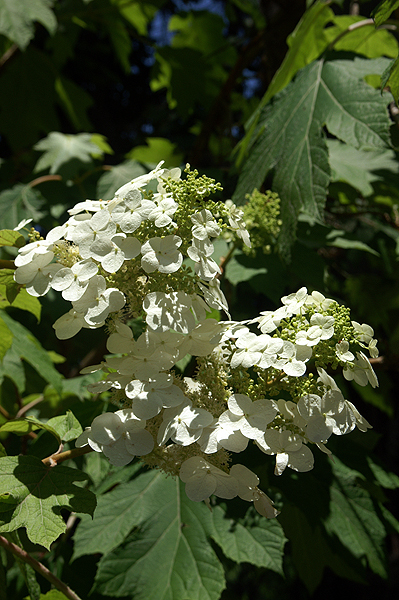 It is filed under Collections, Nature and tagged with blooming, flower, green, Hydrangea quercifolia, Oak-Leaf Hydrangea, plant, shrub, summer, white. You can follow any responses to this entry through the RSS 2.0 feed.